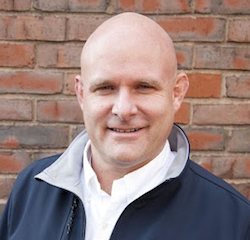 Serial entrepreneur Andy Palmer tells me he doesn't need ink for a new startup space he has opened in Harvard Square, and there's no website for it, either. Palmer says Koa Labs has space for about twenty entrepreneurs, and that he has been fielding inquiries from at least fifty. Desks cost $450 a month, and Palmer says his focus is on "young, first-time folks who want to be on the Red Line." Already working from the space are the Cambridge employees of Recorded Future, a predictive search engine; the Harvard-focused Experiment Fund, run by Patrick Chung and Hugo Van Vuuren; and an energy-oriented hedge fund. Koa is a Maori word that means "happiness," Palmer explains. While Harvard Square has been home to startups like Vlingo and venture capital firms like General Catalyst, this is the first shared workspace for entrepreneurs I've heard of. Palmer has been involved with startups like Vertica, CloudSwitch, and Infinity Pharmaceuticals, in addition to a long-standing relationship with Novartis's Cambridge R&D facility as its head of software. He's also an active seed investor, having done 15 deals in the last nine months. Palmer says he's working on two more projects these days: another collaboration with database guru Michael Stonebraker of MIT, and a spin-out from the Broad Institute of MIT and Harvard. Palmer also writes a blog called The Fundable. 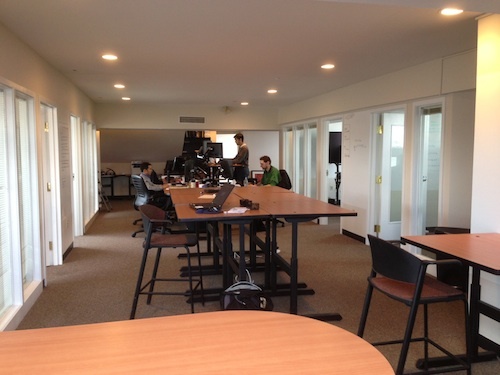 Here's a pic of the top-floor Koa Labs space, conveniently located right next-door to Otto Pizza. There are several offices overlooking Harvard Square, and a conference room at the end of the open area you see below.